In our cells, transcription is not just a simple process of reading DNA and building a complimentary RNA strand. Almost immediately after RNA polymerase begins, the cell is making changes. When the mRNA is only about 30 nucleotides long, the cell makes its first change: it connects a guanosine nucleotide to the end. This "cap" is unusual in several respects: the guanine base is methylated, the connection is formed of three phosphates instead of the normal single phosphate, and the orientation of the nucleotide is opposite from the normal nucleotide-to-nucleotide connection. This unusual structure protects the RNA from enzymes that digest nucleic acids, and also provides a recognizable signal to the molecules that use mRNA. Later, the cell will make additional changes to the growing mRNA, adding a string of adenosine nucleotides at the other end, and then splicing out the regions that don't encode proteins. Messenger RNA caps are made in three steps, each performed by a different enzyme. The brand-new mRNA has three phosphates at the end, so the first step is to clip off one. Then, the second enzyme attaches GMP to the new diphosphate end, creating the unusual triphosphate linkage and reversed orientation. Finally, a third enzyme methylates the guanine base, making it even more recognizable. Amazingly, these enzymes are bound to a long phosphorylated tail on RNA polymerase, so they are held in exactly the right place for modifying a new mRNA as it is transcribed. All three enzymes are shown here. The complex shown here at the top is from yeast (PDB entry 3kyh ), and includes the first two enzymes. The two subunits at the center (in blue) perform the trimming reaction, and the two subunits on either side (in green) perform the nucleotide transfer. In our own cells, one long protein chain with two connected enzymes performs these two reactions. The lower enzyme (PDB entry 1ri1 ) performs the methylation reaction. When cells are done with their mRNA, they need to recycle them. To do this, they need to remove the cap, so that the RNA-digesting enzymes can get to work. 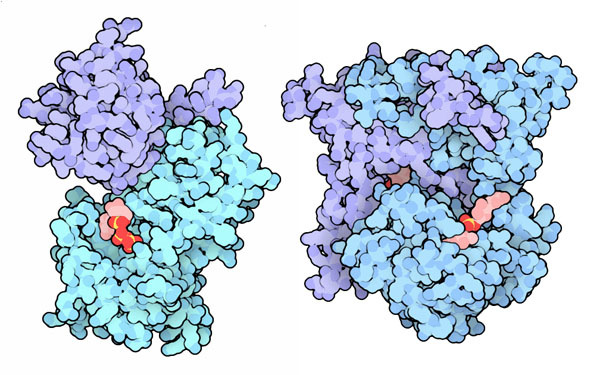 Two decapping enzymes are shown here. On the left is Dcp1/Dcp2 (PDB entry 2qkm ), an enzyme complex that recognizes old or obsolete mRNA and clips off the cap, allowing access to enzymes that chew away nucleotides from the end. A "scavenger" decapping enzyme is shown on the right (PDB entry 1st0 ). It removes the cap from RNA that has been chopped into pieces by exosomes. The GMP-adding enzyme opens and closes during its complicated reaction. It performs the reaction in two steps. First it finds a molecule of GTP, closes around it, and attaches the nucleotide to one of its own lysine amino acids. Then, it opens up and releases the pyrophosphate that it removed from GTP, and closes around the end of the mRNA, performing the nucleotide-transfer reaction. After these two steps it opens back up to release the capped mRNA. Researchers have captured a viral form of the enzyme in several of these steps (PDB entries 1ckm , 1ckn and 1cko ). Click on the image to see an interactive Jmol that shows the structures. 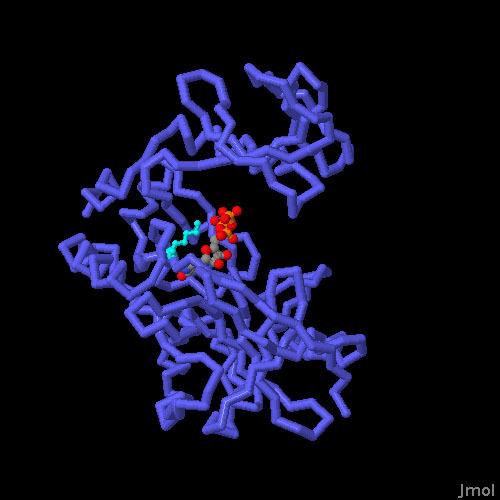 PDB entries (3rtx and 1p16) show a small portion of the C-terminal tail of RNA polymerase bound to a capping enzyme. 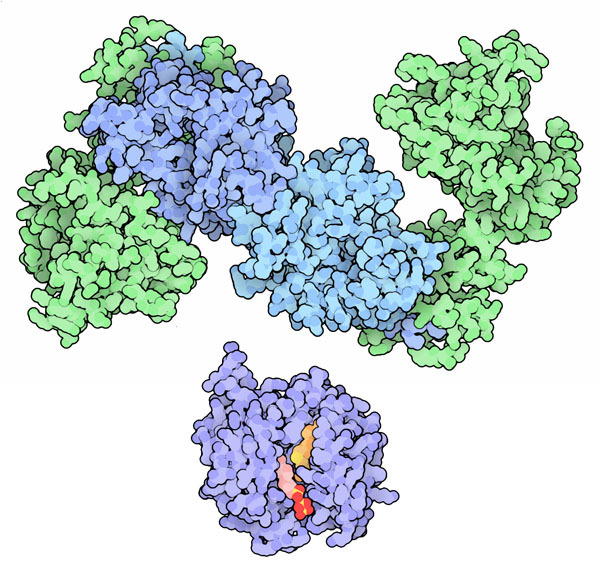 The ligand in PDB entry 1cko is an analogue of the capped mRNA. Take a close look at the structure and determine what part of the ligand is the added nucleotide, and what part represents the mRNA. A. Ghosh and C. D. Lima (2010) Enzymology of RNA cap synthesis. Wiley Interdisciplinary Reviews of RNA 1, 152-172.